The quick and simple answer is that data transfers result in information being copied and data access represents interacting with information in situ. The more elaborate answer goes into a little more detail and uses some examples to illustrate how each relationship is used. Data access is primarily a relationship between behavior and information. The behavior reads from or writes to the information in place. There is no transfer of information or copies being made of the information. 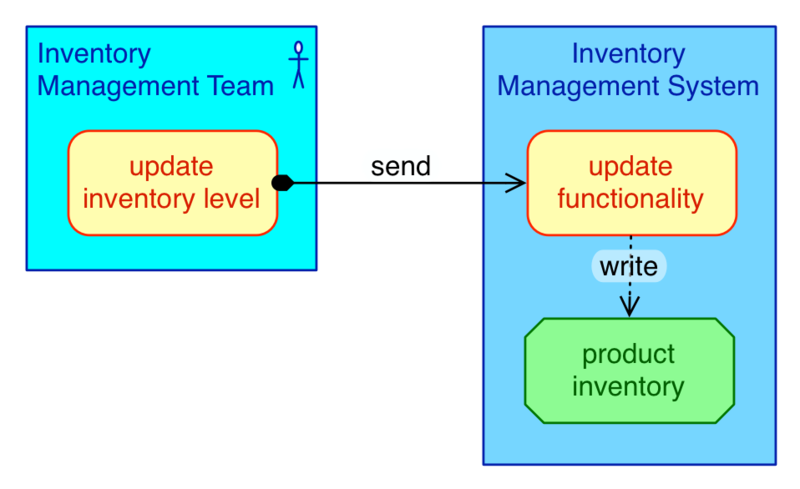 The image above simplistically shows how a team performs the activity to the inventory levels stored in a computer system. This is a good simplification which shows the main actors. In reality, direct interaction by a team with the information stored in a system does not occur. The image below shows what actually happens. Here I introduced a functional access relationship between the Inventory Management Team function and the Inventory Management Systems function. Note that the direction of the arrow on the functional access relationship indicates the most relevant direction of data flow. In this case since we are talking about updating the product inventory, an update is sent. This allows us to easily follow the flow of the information in the diagram. Now to contrast data access with data transfer. In the image above a copy of the inventory levels from the Inventory Management System is transferred over to the Order Taking System. The product inventory levels are then used locally by the Order Taking System. In a sense this depicts a caching approach at a systems level. However, in situations like this it is more likely the Order Taking System product was built assuming a local copy of product inventory levels and the enterprise solution involved integrating the Inventory Management System with the Order Taking System using a data transfer approach. If you want to go a little more advanced in your diagrams, I have found it is a good idea to differentiate between information records and information references or copies. The image below is using the PrimaryScape extended notation, which is also really simple. The information records in this diagram are shown in bright green. The example so far has shown data transfer directly between two systems. In many situations this is exactly the level of detail you want to capture and convey. One can also use the data transfer relationship to show in greater detail how two systems are integrated. 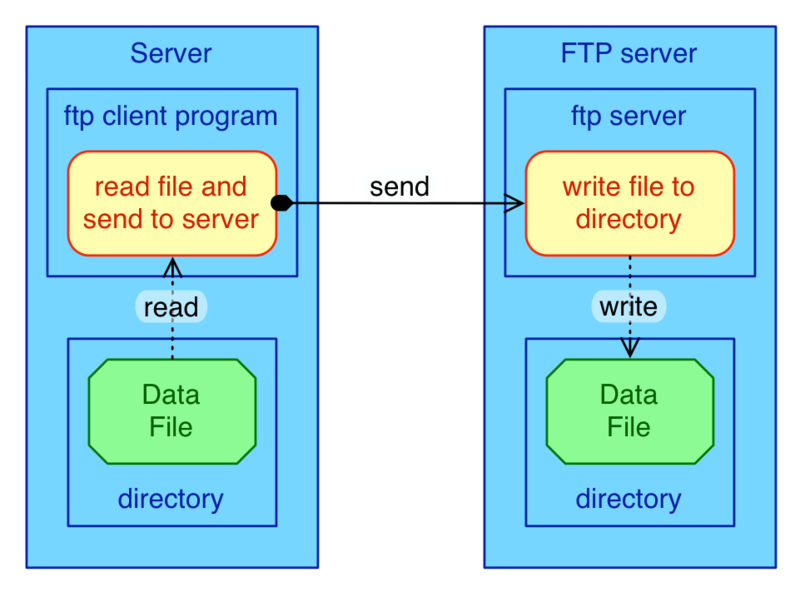 The image below shows how an FTP server is used. It also uses another extended notation to indicate transiently stored information. Technically speaking the data transfer relationship is just a very useful shorthand used to keep diagrams simple and easy to understand. The two images below shows you one simple diagram which simply shows what happens and another diagram which goes into the detail of exactly how the file is transferred. Note that the second image does not use the data transfer relationship. Hopefully this clarifies the difference between the data access and data transfer relationships. To understand this difference and how to use these relationships appropriately is more important to those who create PrimaryScape diagrams. 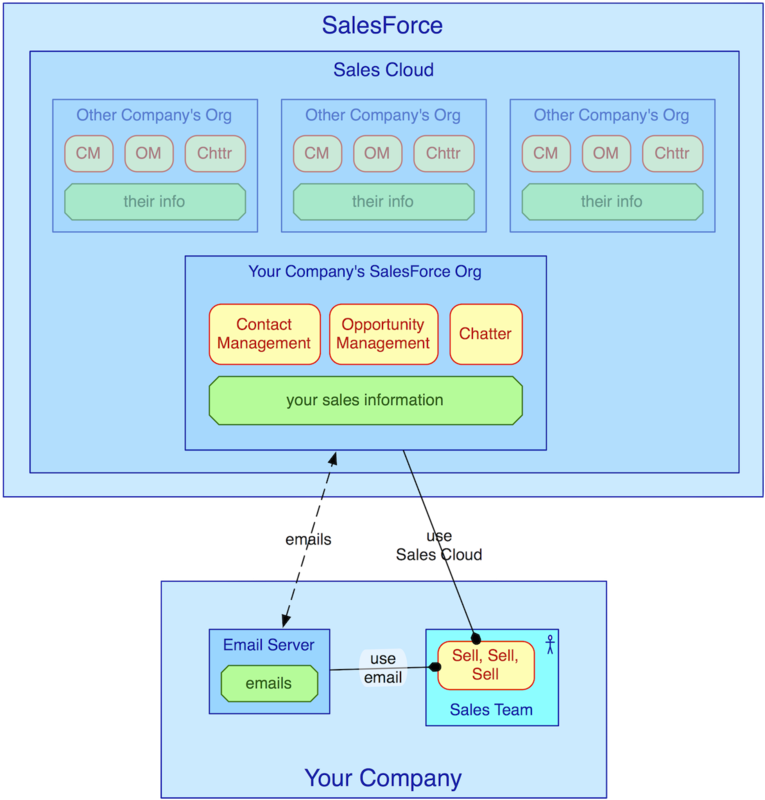 When it comes to a greater audience it is enough to explain that the direction of the arrows used with the different types of relationships shows them the direction of information flow in the PrimaryScape diagram. Most of the times this simple understanding is enough to get what a PrimaryScape diagram is intended to convey to a greater audience. If you have any other questions feel free to email them to info@primaryscape.com. SIPOC is a tool to capture information about processes. 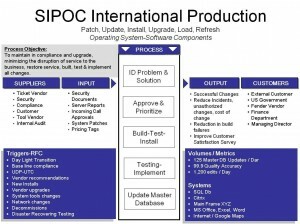 SIPOC is an acronym for Suppliers, Inputs, Process, Outputs, and Consumers. A SIPOC is typically captured in a table or grid format. Here are a couple of examples based on some quick google research. Click on them to zoom. 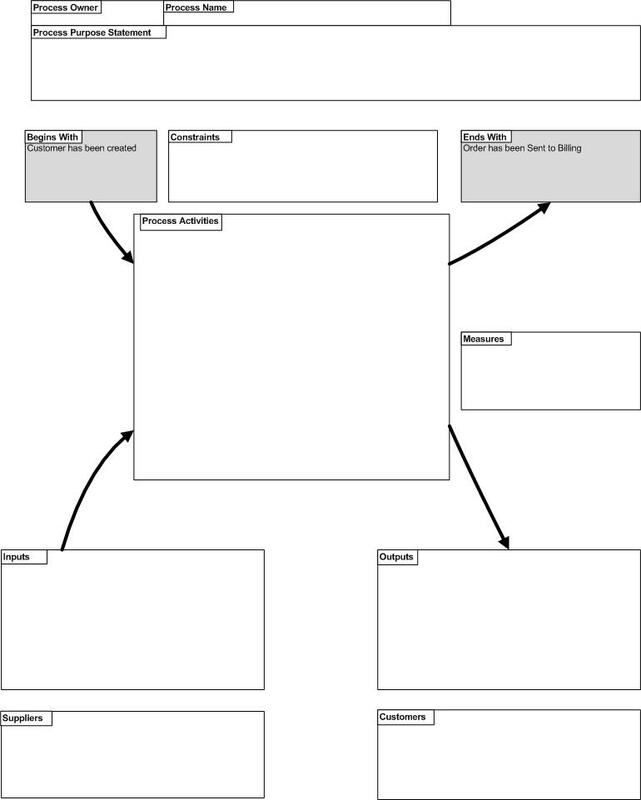 PrimaryScape™ can be used to capture the SIPOC process model. The most simple representation using only the SIPOC terms is shown below. However, this simple model can be elaborated to more clearly capture the concepts involved. Input and Output is information which comes from and goes to the Supplier and Consumer respectively. The Process itself is realized in some kind of structure. Showing the structure which realizes the Process help convey the scope of the SIPOC. The Process is triggered by an Input data transfer from the Supplier and it ends by transferring Output data to the Consumer. However, most behavior tend to act on information and produce information. 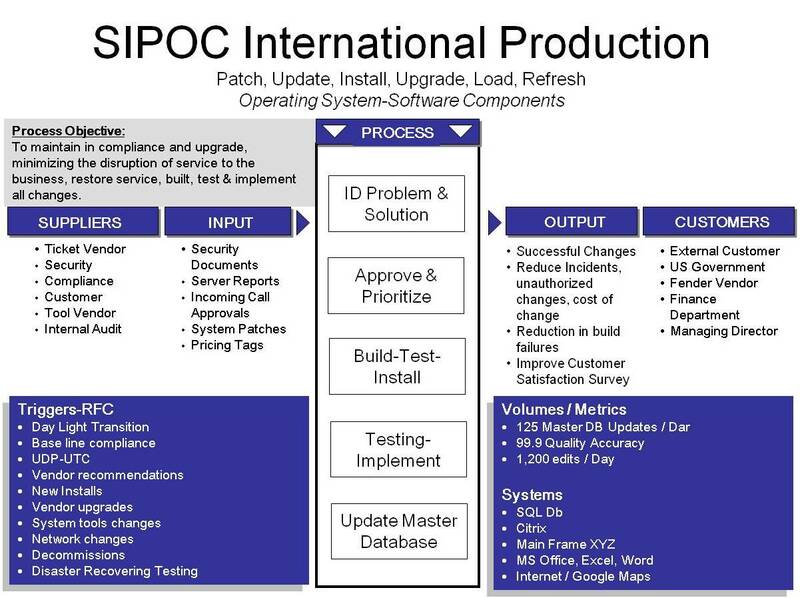 In this expanded SIPOC model both reference information and transactional information are shown. PrimaryScape™ diagrams are also easier to explain by using a sequence of diagram snapshots. The mini slideshow below is an example of using this trick. This is a mini slide show that will walk you through the extended PrimaryScape SIPOC model. We start with the Supplier which is represented as a structure. 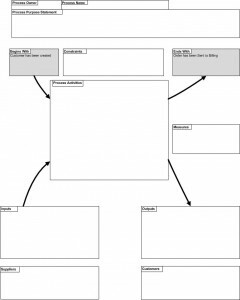 These kinds of storyboards makes it possible to present relatively complicated diagrams while at the same time bringing the audience along step by step. This greatly increases the chance that the audience will truly understand a complicated diagram.